Tonsillitis In Children Dubai | Is Your Child's Sore Throat Actually Tonsillitis? Tonsillitis In Children Dubai | Is Your Child’s Sore Throat Actually Tonsillitis? Tonsillitis in children Dubai: Streptococcus A is a bacterium that can cause infections from those that are mild to those that may be deadly. Strep A can cause tonsillitis, skin infection and Scarlet fever. Tonsils are lymph glands situated on either side at the back of the throat. They are there to protect any infection going down to the chest. However, these can get infected. Most sore throats are caused by viruses, but strep throat is caused by bacteria called group A Streptococcus or group A strep. Why is it important to treat Strep throat with antibiotics? Complications can occur if the infection is not treated completely. It can affect the heart (rheumatic fever) or kidneys (post-streptococcal glomerulonephritis). Group A strep live in the nose and throat and can easily spread in small droplets of water called respiratory droplets when the infected person sneezes or coughs. The droplets can touch one’s mouth or nose. One can also become ill if one drinks from the same glass or eat from the same plate as a sick person. It is possible to get strep throat from touching sores on the skin caused by group A strep (impetigo). Strep throat occurs more in children. 4 to 6 in 20 children between ages 5 to 15 can get strep throat. It is less common in children below 3 years. Other symptoms may include a headache, stomach pain, nausea, or vomiting — especially in children. A cough, runny nose, hoarseness, and conjunctivitis are not symptoms of strep throat and suggest that a virus is the cause of the illness. Someone with strep throat may also have a rash known as scarlet fever. A rapid strep test or a throat culture is needed. A doctor cannot tell if you have strep throat just by looking at the throat. 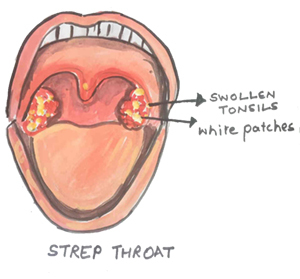 A rapid strep test involves swabbing the throat and running a test on the swab to quickly see if group A strep is causing the illness. 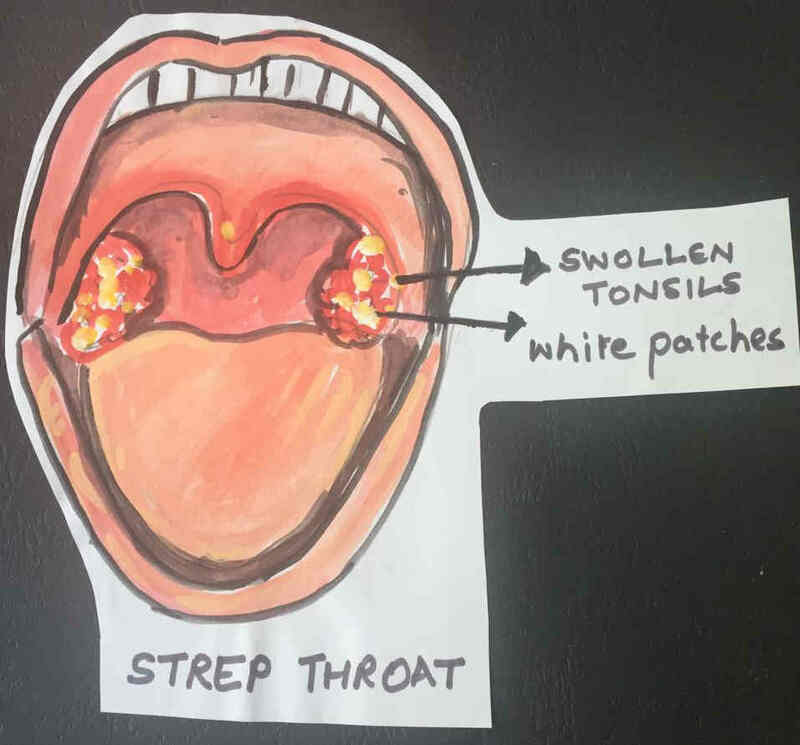 A culture test requires more time to get the results but can be important to use in children and teens because they are at risk of getting rheumatic fever if their strep throat infection is not treated. Unlike sore throats caused by viruses, strep throat is treated with antibiotics. Either amoxicillin or augmentin is recommended as the first choice for people who are not allergic to penicillin. Antibiotics help shorten how long someone is sick, prevent spreading the disease to others, and prevent getting complications like rheumatic fever. The antibiotic course is usually for 10 days. Children with group A strep pharyngitis should stay home from school, or daycare until they are afebrile and until 24 hours after starting appropriate antibiotic therapy. Someone who has no symptoms but tests positive for strep throat is known as a “carrier.” Carriers usually do not need antibiotics. They are less likely to spread the bacteria to others and very unlikely to get complications. If a carrier gets a sore throat illness caused by a virus, the rapid strep test can be positive even though the illness is not caused by the bacteria that cause strep throat. Recurrent pharyngitis without a cough or congestion. Acute rheumatic fever or post-streptococcal glomerulonephritis outbreaks. GAS pharyngitis outbreaks in a closed community. The family history of acute rheumatic fever. excessive patient/family anxiety about GAS. All treatment options, except tonsillectomy, have been exhausted. Oral clindamycin for 10 days is probably the most effective treatment for carriers. 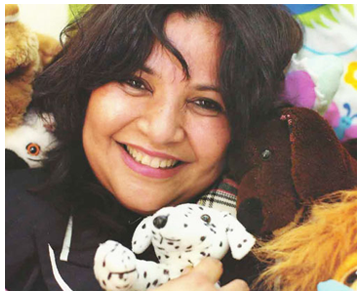 If you like what you have seen or read about tonsillitis in children Dubai, please share it with your friends by clicking on one of the social media buttons below. Tonsillitis in children Dubai: Find out the symptoms and transmission of tonsillitis along with how to diagnose and treat it. Get answers to the top 12 questions!